Sandy Siegel, the President of the Transverse Myelitis Association, has written what I consider the most moving and insightful commentary on "The Best Seat In The House" to date. It appears in the latest edition of the Journal of the TMA. You can find the article on line at http://www.myelitis.org/newsletters/journal-2-31.htm. In any case, please go to the TMA site -- www.myelitis.org -- and learn more about the great work they are doing. And please send them a donation, if you feel so moved. For anyone contracting transverse myelitis or associative disorders for the first time, this is invariably the first place you would call. And your call will probably be returned by Sandy Siegel. Thanks, Sandy, and thank YOU for blogging. I'm in LA but my mind is still back in Doha, Qatar, watching the sun go down and getting ready for a freshly-squeezed kiwi juice cocktail. Photos by Columbine Goldsmith. 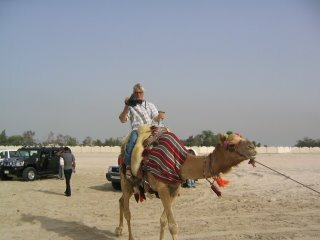 Columbine Goldsmith sent me these pictures of being outfitted for a snazzy Arab outfit in a souq in Doha. The local merchants couldn't have been nicer. In one picture you'll see Paul Goldsmith and Chet Cooper in the background. I have the outfit at home. I wear it around the house when "Lawrence of Arabia" is playing. While the staff of allenrucker.com updates the NEWS section for the summer season, here's a programming reminder for LA area TV-watchers: "Life & Times," KCET, the public TV station in LA, is re-running a story about my paralysis this Friday, May 11th, at 7 pm. It is also available as a video clip at http://www.kcet.org/lifeandtimes/healthscience.php. The story is called "Paralyzed Overnight." We know you have a choice in blogs. Thanks for choosing ours. A shameless plug for ABILITY magazine, for whom I am now writing on a semi-regular basis. I got to know these people when they dropped by the house for a long interview about the book in January. Check it out at http://abilitymagazine.com/Garr/allen_rucker.html. Then I wrote a column on the bogus cultural cliche, "60 Is The New 40", in the current issue and am working on a long piece on the whole Qatar adventure for the next issue. Excellent articles, excellent graphics, excellent mag. For more, go to www.abilitymagazine.com. 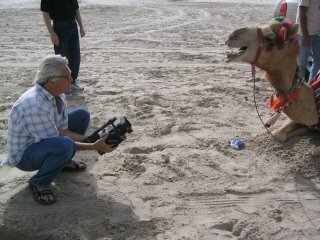 Some of my favorite camel shots -- Paul Goldsmith getting a CU of those gnarly teeth then riding and shooting from on top.